Size of this preview: 800 × 533 pixels. Other resolution: 810 × 540 pixels. Deutsch: "Flagge der EUdSSR" als Kombination aus "Flagge der UdSSR" und "Flagge der Europäischen Union". Die 12 Sterne Europas durch Hammer-und-Sichel-Symbol ersetzt. English: "Flag of the EUdSSR" as a combination of "Flag of the UdSSR" and "Flag of Europe". 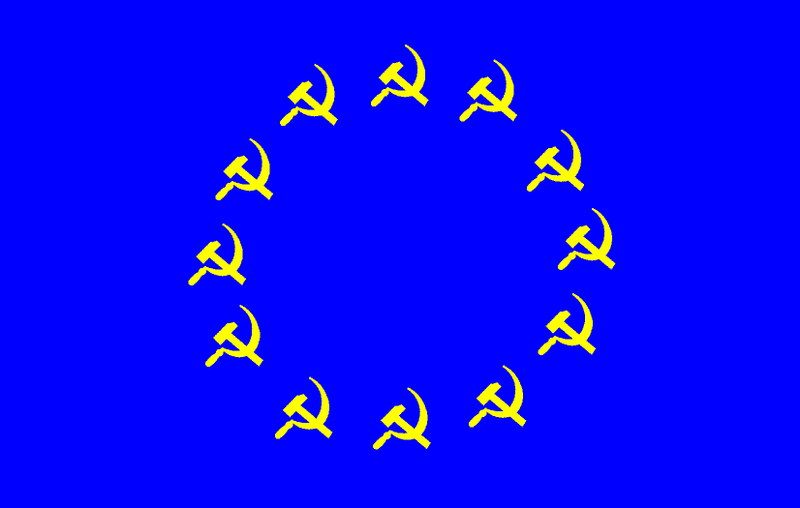 The 12 stars of Europe replaced by hammer-and-sickle symbol. Español: "Bandera de la EUdSSR" como una combinación de "Bandera de la UdSSR" y "Bandera de la Unión Europea". Las 12 estrellas de Europa reemplazados por símbolo del martillo y la hoz.